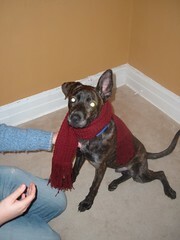 What could be better than a dog modeling a scarf? This entry gives me a chance to update everyone on Duke. About 6 weeks ago someone decided to give this dog a chance with a new family and threw him over the fence at Canine to Five. He was emaciated and scared, but has grown into the sweetest boy ever. He has a lot of puppy left in him, but he is eager to please and is just a love who likes to be cuddled. My ferocious pit bull also likes to spend quiet time with his girlfriend at day care, and shies away from the rambunctious dogs. This weekend he shared his kong with Annie. After he worked it, she picked it up to get the peanut butter in the bottom, and Mr. Man Dukus cuddled up next to her and let her work on it. We are so blessed to have this dog in our life. And this morning, he did the Tawny-dog head turn and talked back to me. Mom knows what I mean. 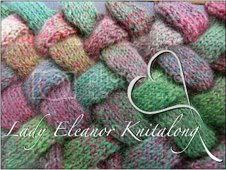 It curls a bit in this lighter yarn, but is still lovely. And I am now an absolute expert in cabling without a cable needle. I also have Murphy model all FO's. LOL. There could be no better model than a furry one.